Whether it’s a painful shoulder, knee or elbow, tendonitis and bursitis are troublesome conditions that can affect just about anyone. The pain can come gradually, building up over time. Or it can feel sudden and severe. If you feel concerned or unsure about the cause of pain, see your doctor. But in many cases, it’s sensible to give rest and home remedies time to work. Tendonitis and bursitis are usually caused by repetitive activities. These include gardening, shoveling, painting, or playing tennis or golf. 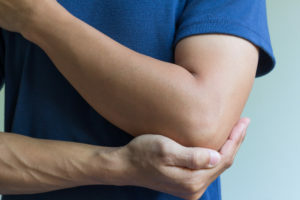 What’s happening when these conditions strike is a strain to the tendons that connect bone to muscle (tendonitis) or inflammation to the bursa, fluid-filled sacs that reduce friction in the joints (bursitis). Since every joint has a bursa, these two conditions often go hand-in-hand. They are especially common in the rotator cuff of the shoulder and in the patellar tendon that connects the knee cap to the shin bone. In most cases, you can treat tendonitis and bursitis at home with rest, ice and over-the-counter anti-inflammatories, such as ibuprofen or naproxen. It may seem simple, but also try to avoid the motion that originally caused the pain. Give about four to six weeks for these home remedies to help. But if the pain persists, call your doctor. If tendonitis and bursitis are still causing pain after treating them at home, your doctor will often start your treatment with physical therapy. It can help to alleviate symptoms as well as strengthen the area of injury. Phonophoresis: This technique uses ultrasound to help anti-inflammatory creams absorb through the skin. Iontophoresis: Similar to phonophoresis, this technique uses electrical stimulation to help anti-inflammatories penetrate the skin. Cortisone injections: Injections of this steroid medication can help significantly reduce the inflammation that comes with persistent tendonitis and bursitis. Some people think that pain is a sign that something damaging is going on in their bodies. But that’s not always the case. Tendonitis and bursitis may cause temporary pain and discomfort, but they usually don’t cause long-term damage and rarely require surgery. Take tendonitis and bursitis for what they are — overuse injuries that are common and easy to begin treating at home. Often, this is all they need to resolve. If they don’t within a month or so, call your doctor. Q & A: Can Cortisone Injections Ease My Joint Pain?